“is this place farm-to-table?” kari asked as i passed the car keys to the valet. “ha! you crack me up!” we were in auburn this past weekend to celebrate clark’s graduation with his masters of accountancy (we’re so proud! ), but more on that later. once the ceremony ended, we made the short drive to acre off east glenn avenue. i was instantly excited as we drove up and approached the restaurant. isn’t it just beautiful? clark, mom, and dad had been here once already, so the fact that they all agreed they should come again means a lot. we were a little early for our reservation, so naturally we swept past the host stand and to the bar. acre is modern and fish and clean and put-together. the décor is mature without being stuffy, and the atmosphere is youthful without being too whimsical. i think the perfect word might be sophisticated. yes, a sophisticated spot in the heart of auburn, al. to the left of the bar. drinks were ordered and cheers were given. we were all together again! mom appreciated the simplicity of her vodka tonic, dad liked the crisp and cold taste of his boston lager, kyle’s coke and crown was classic and delicious, kari liked the refreshing summer shandy cocktail she sipped on, and clark liked the acre iced tea so much that he ordered two! 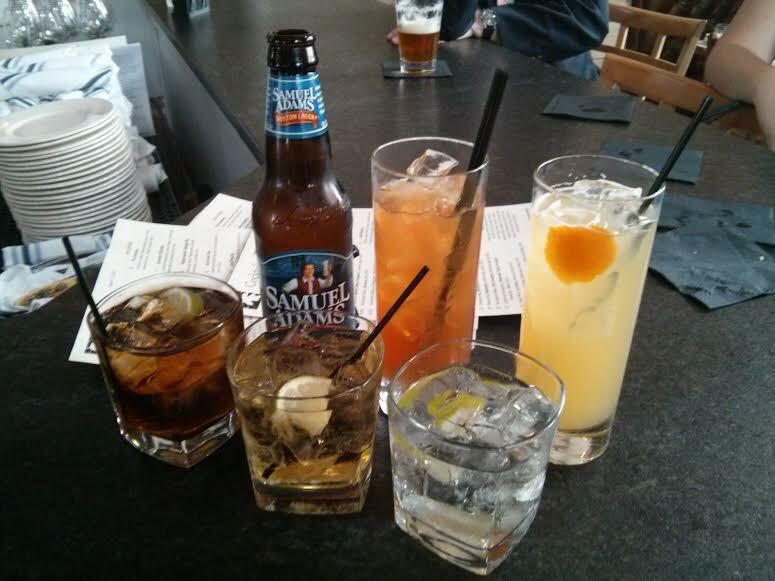 i had started with a 7 & 7 (but with crown because they didn’t have seagram’s…) and it was nice and strong. i needed something a little different for my second round, so i ordered the just peachy. 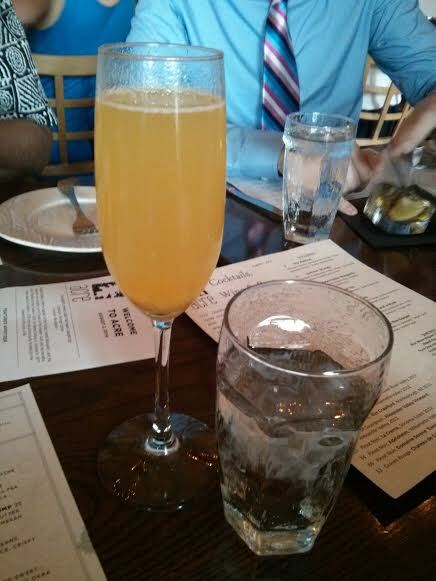 it wasn’t overly sweet, a well-balanced drink with the peach, mango, and persecco. however, this drink is not one to be eaten with dinner. definitely a great starter though! 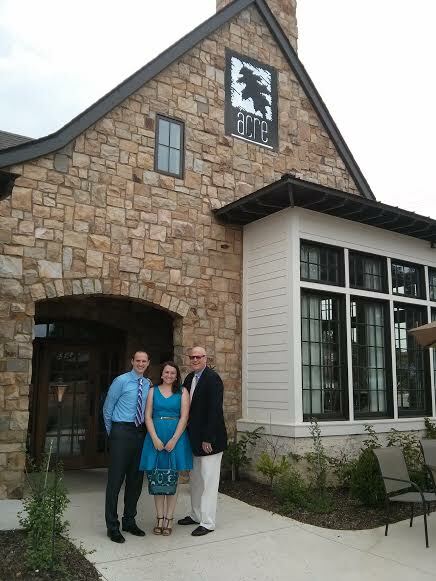 it was clear plenty of other guests were here celebrating graduation as well; there was so many families at acre! ah, it makes my heart happy just to think about it. although our family isn’t too wide spread across the states, we’re all so busy that it isn’t often we’re all in one place. i shall savor the moment while it lasts! we were seated along a couple of tables and quickly took a look at the menu. we were a hungry bunch! dad ordered the pimento cheese and jalapeno poppers for the table to share. the pimento cheese was very well done, nice and creamy, “solid” as kyle put it. the smoked paprika chips were a fantastic idea, as they brought an unexpected yet pleasant flavor to the mix. the jalapeno poppers were a little too mild for milo’s taste, but the verde sauce atop each fried popper was very delicious. and, to no one’s surprise, i started with the roasted garden beets. i needed some kind of vegetable for the day! 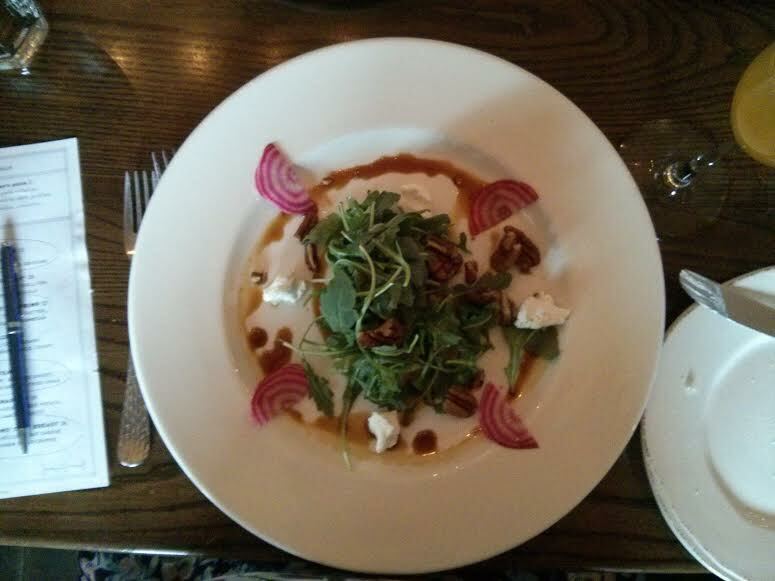 the trend these days seems to be exactly what the equation here at acre is: beets, goat cheese, pecans or walnuts, and a leafy green (typically arugula). the presentation was quite nice, yes, but i wanted more beets! i love that they had golden beets in there, hidden below the pile of arugula. i just craved more of ’em! there really needed to be just a touch more seasoning or something, as the natural flavors (with the exception of the goat cheese) were on the bland side. as the main courses arrived, i was in awe. the food was so beautiful. i don’t use that word often when i’m eating, but don’t tell me these plates don’t look divine. it is clear that chef bancroft and chef donnelly have taken serious consideration into all elements of this restaurant. 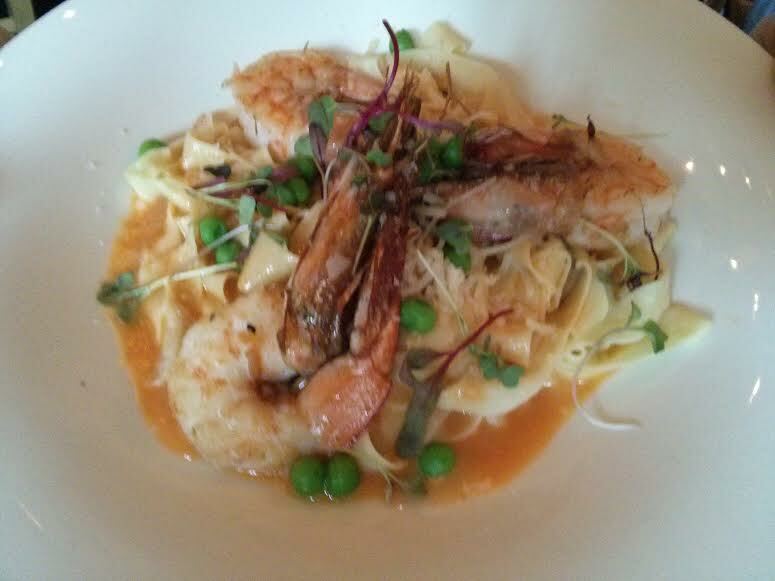 ingredients are locally sourced to provide the freshest and most seasonal flavors. they even have an on-site vegetable garden that can be picked, prepared, and served immediately. so the food was beautiful, but was it savory and delicious and unforgettable? yes! we’ll start at the head of the table and work our way around. milo treated himself that evening and had the barbecued ribeye steak. 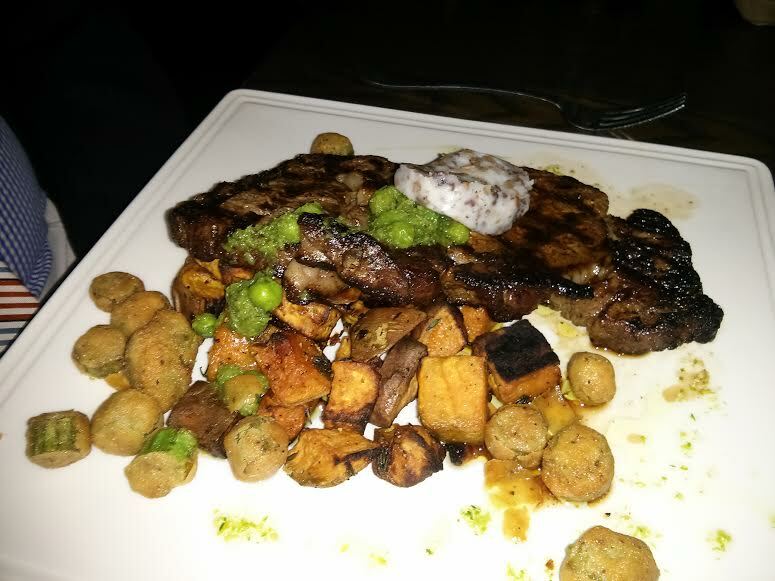 the steak was very tender, the okra was crispy and not soggy, and the sweet potatoes were well seasoned and hadn’t lost any of their moisture while roasting. he wouldn’t hesitate to order it again if given the chance. mom and kari both enjoyed the head-on ‘bayou la batre’ shrimp. it was quite funny, actually. their bowls arrived, and kari was quite surprised to see the heads on the shrimp. she asked aloud if that had been included on the menu, and we teasingly told her it had been. but! her loving to-be mother-in-law deheaded her own bowl of shrimp first and passed it to kari. it was such a sweet gesture! both ladies loved the dish. they agreed that the fettuccine was outstanding. it had clearly been made that same day; it was so light and delicate and thin. they had expected heirloom squash, according to the menu, but instead sweet peas adorned the dish. perhaps the squash had arrived at the kitchen and was no good? regardless of why they were there, the fresh peas were enjoyed. the menu had also indicated the butter would be a bit fiery with the spicy tomato, but mom and kari concurred that the broth was more mild yet still quite rich, so rich that it needs to be eaten slowly. head-on ‘bayou la batre’ shrimp. 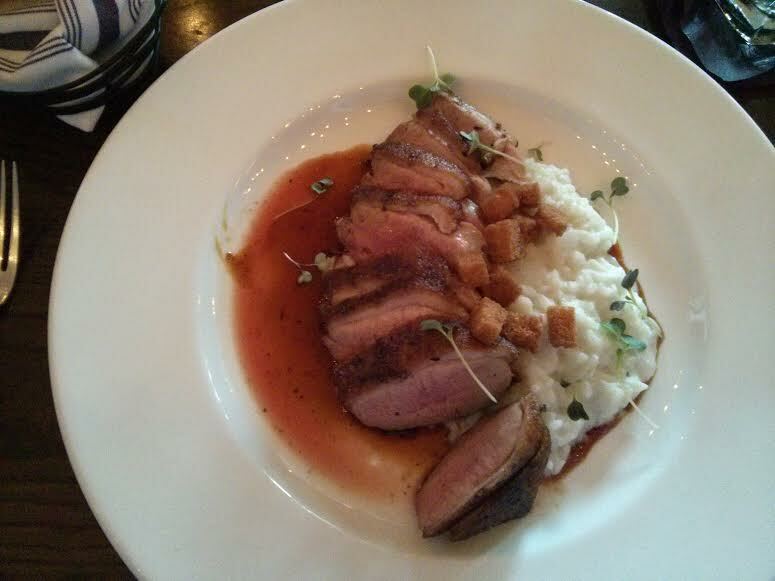 kyle enjoyed the crispy ‘culver farms’ duck breast. let me quickly take a moment to say that a lot of the menu items here contain quotes of some sort. it actually is something that kari pointed out to me. just a note, nothing more! anyway! i didn’t get a good look at his dish while we were at the table, but when he snapped this picture for me, i was almost drooling. that risotto looked incredible, and he said it was not too mushy or firm. the ginger breadcrumbs added a nice crunch for texture, and the duck breast was lean, well-cooked, and “on point” with the smoked chili-honey. he was a clean plate club member at this meal! crispy ‘culver farms’ duck breast. ah, but now, what did i have to eat? 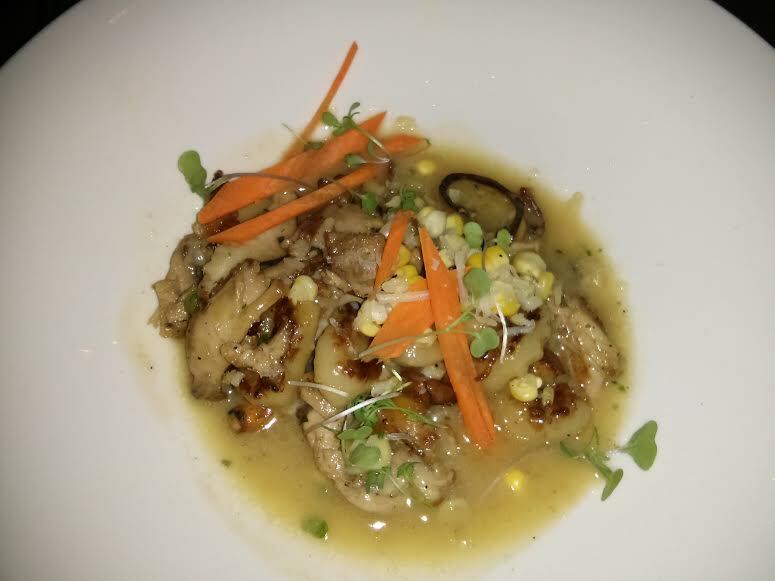 i ordered the seared ricotta gnocchi, and it is one of the best bowls of food i have had in a while. the chanterelles were chewy (in a good way) and the sauce? oh my. the rich buttery aroma was just as lovely to eat as it was to smell. i even asked for a spoon and some bread to finish it all off after it was said and done. the rabbit didn’t taste too “wild,” which i appreciated. i just wish there was more of it. 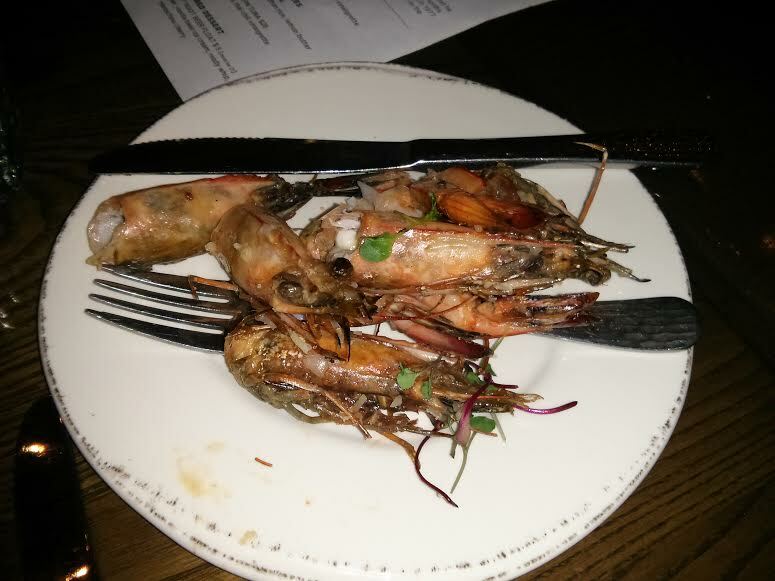 but, considering the dish is a starter on the menu, i guess it’s supposed to be a more modest portion. the carrots were crisp and the corn was nice and sweet. now, as for the gnocchi. it was unreal. i left all those little pouches of goodness for last and was afraid to take the last bite, for then it would be gone! they were soft and delicate and just the right ticket for this dish. as we walked out of acre, i was satisfied. 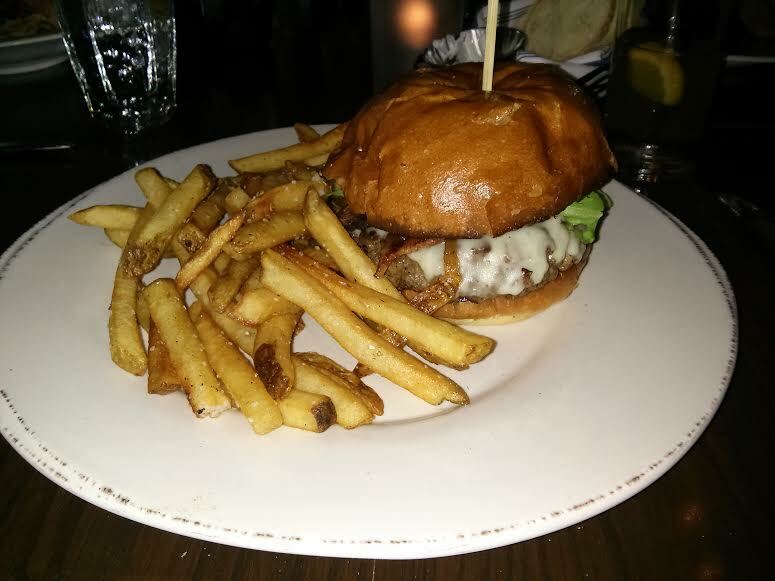 the food was outstanding, the service was polite, and the company was perfect. i know as we grow older these long moments of togetherness may be further in between, so i’ll be sure to soak up each moment of those that we do have. to family! to family!